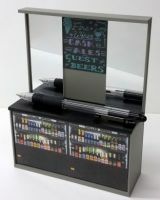 1/12th scale collectable Dollshouse Miniature, Rear Bar Counter in a modern style, to compliment our M48 Bar. This Rear Bar has a Black Satin Top, deep enough to accomodate our M140 Espresso Machine if desired, and also has 'bottle cooler' panels under. The upstand at the back has mirrors and blackboard with 'bar attractions' 'chalked' on. We have changed the colour of our Bar, Rear Bar and Dartboard for a more contemporary GREY colour.